Though this duo has been making music since the mid-70’s they found their greatest success during the 1980’s. They have some of the biggest hits of the decade, which got them in the 2014 Rock and Roll Hall of Fame. 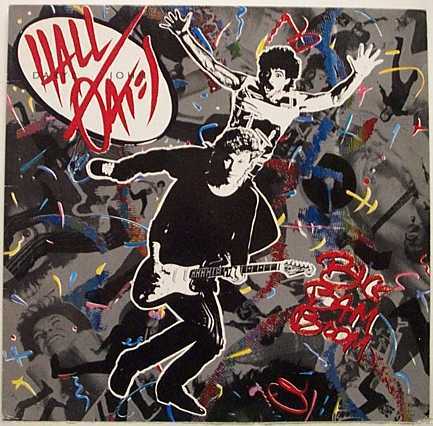 Hall & Oates is one of those bands that can be really really good or really really cheesy. The thing is no matter which version you get, they’re both awesome. This album combines both sides of the band to make for their most fun and upbeat record. It’s also their most ambitious, since it found the duo stepping out of their comfort zone. Things kick off with the wonderfully weird instrumental “Dance On Your Knees.” It’s actually an homage to Grandmaster Flash and the Furious Five’s song “White Lines.” It slowly builds up with each instrument coming in one at a time. When it all comes together it has this big, booming sound (hence the album title) and slowly evolves into the music for the next track “Out of Touch.” This remains one of their catchiest and most playful songs. It has a funky groove and an extensive use of synth, more-so than past efforts. It’s a fun song that makes you want to dance and sing. “Method of Modern Love” is another super fun track with an infectious chorus of “M-E-T-H-O-D-O-F-L-O-V-E.” The blaring horns and light tapping drums gives it this tropical/pseudo Latin vibe, something unexpected from these guys. It also has a slinky funk driven bass during the bridge that brings everything together. Though the lyrics are pretty standard for the duo, there’s one line that stands out: “Style is timeless and fashion’s only now.” It’s such a clever line that still resonates today and it’s so true. Think of the trends that have come and gone only to come back again (looking at you tattoo chokers). Anyway, it’s a great song that doesn’t get as much recognition as their other hit singles. “Bank on Your Love” shakes things up a bit with its rock vibe thanks to the prominent guitars. Synth also makes a return making it sound like Bruce Springsteen song, at least in terms of music. Though it’s not as catchy or fun as the previous tracks, it’s still pretty solid. Things pick up again on “Some Things Are Better Left Unsaid.” Out of all the tracks here, this one fits in the most with their earlier material. But what stands out the most are Hall’s vocals. He’s always been a decent singer, but here he sounds so soulful. It’s like he’s giving it his all and he sounds great. I’m not sure why he sounds better on this track than the others, but at least to me, he does. One of the most exciting songs on the LP is “Going Through the Motions.” The way the track opens with a stuttering effect catches you off guard. It’s not something you expect from Hall & Oates. It manages to wake up the listener and keep them on their toes. From there the music tuns into a blend of synth electronica, R&B, and funk. There’s a lot going on musically, but it never sounds disjointed. It gets you moving and is really catchy like the previous songs found here. Though the song is a bit lengthy, especially when the stuttering effect makes a return, it’s still a stand out track. “All American Girl” is a weird, yet lovable song. It begins with light, bubbly synth that sounds like phone buttons being dialed. The music then returns to a blend of hip hop, synth, funk, and R&B. Again, it’s really exciting and has an irresistible beat, but things go a little sour when the two start rapping. That’s right, this track has a little rap from the duo and it is bad. They gave it their best, but it’s something you don’t want them to do again. Otherwise, it’s an upbeat track that’ll put you in a good mood. The album has two songs sung by John Oates (the one with the mustache) and they’re not the best. “Cold, Dark and Yesterday” has good funk inspired music, but he doesn’t have the best vocals. For some reason this track reminds me of a sub-par Prince song. Hall’s backing vocals definitely saves this from being terrible. The closing song “Possession Obsession” is better than the previous one, but still one of the weakest tracks. It just doesn’t grab your attention like the other tracks and isn’t very memorable, which kind of describes Oates. Though there are two less than stellar songs, this still remains one of their better records. Overall, the album gets 8.5/10. What makes this album so exciting and interesting is how the band strays away from their established sound and instead play with different elements of funk, R&B, and even hip hop to liven up their sound. As you would expect from one of their albums, there are some hook filled tracks on here along with some that border on cheesy, but are still really fun. This album shows why the duo was and still is one of the most beloved bands of the ’80s.